But while never surrendering, the change of the fort's name, from "Frankfort" to "Ashby," might be considered the result of a "retreat." 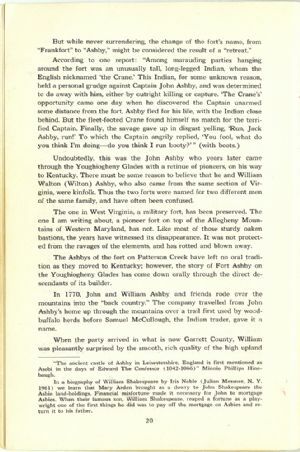 Undoubtedly, this was the John Ashby who years later came through the Youghiogheny Glades with a retinue of pioneers, on his way to Kentucky. There must be some reason to believe that he and William Walton (Wilton) Ashby, who also came from the same section of Virginia, were kinfolk. Thus the two forts were named for two different men of the same family, and have often been confused. The one in West Virginia, a military fort, has been preserved. The one I am writing about, a pioneer fort on top of the Allegheny Mountains of Western Maryland, has not. Like most of those sturdy oaken bastions, the years have witnessed its disappearance. It was not protected from the ravages of the elements, and has rotted and blown away. The Ashbys of the fort on Patterson Creek have left no oral tradition as they moved to Kentucky; however, the story of Fort Ashby on the Youghiogheny Glades has come down orally through the direct descendants of its builder. In 1770, John and William Ashby and friends rode over the mountains into the "back country." The company travelled from John Ashby's home up through the mountains over a trail first used by woodbuffalo herds before Samuel McCullough, the Indian trader, gave it a name. "The ancient castle of Ashby in Leicestershire, England is first mentioned as Asebi in the days of Edward The Confessor (1042-1066)" Minnie Phillips Hinebaugh. In a biography of William Shakespeare by Iris Noble (Julian Messner, N. Y. 1961) we learn that Mary Arden brought as a dowry to John Shakespeare the Asbie land-holdings. Financial misfortune made it necessary for John to mortgage Asbies. When their famous son, William Shakespeare, reaped a fortune as a playwright one of the first things he did was to pay off the mortgage on Asbies and return it to his father.